Dark hair, dark eyes and dark skin leave the proud woman looking exotic and sure of herself. A wide jaw is softened by her small chin and sculpted cheekbones that frame large dark eyes. Her cheeks themselves allow for a dimpling when her full lips draw back into a smile. She exudes nobility in every movement and ever word. Dorne fashion is in light layers to afford for the heat and her's are no different. A few drapes in elegant near shear red silks frame ther womanly form. Edged in golds she might as well be proclaiming her family's name. A pair of gold satin slippers house her feet. The daughter of Prince Qoren Martell. She sees herself as a new Nymeria. 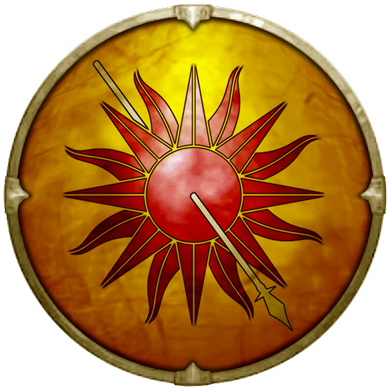 She is a fiery young woman who encourages her lords and knights to prove themselves to her by raiding in the Dornish Marches. Aliandra is engaged to Drazenko Rogare.